In 2009, as part of celebrations commemorating Bermuda’s four hundred year anniversary, Bermuda’s Government memorialized the historic struggle of blacks against slavery by erecting a statue of Sally Bassett on the lawn of the Cabinet Office. Bassett was an enslaved Black woman who was burned alive at the stake in 1730 for allegedly poisoning her masters. 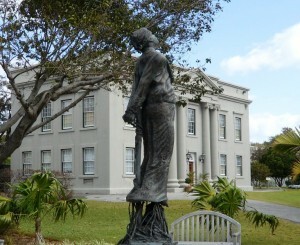 Some Bermudians publicly decried the statue as being “inappropriate” on the grounds that that Bassett was a convicted criminal. On the other hand, many Bermudians argued that Bassett was a freedom fighter who symbolised resistance to slavery and needed to be considered a national hero. Also perplexing to some was a speech made at the unveiling by Governor Richard Gozney, who compared Bassett’s monument to that of Confederate General Robert E. Lee. Many publically denounced this comparison between Bassett, who fought against slavery, and Lee, who owned slaves and defended the institution. This led to an open and heated debate about the nature, memory and legacy of slavery in Bermuda. Earlier this year Bermudian historian Dr. Quito Swan delivered a presentation to the American Historical Association exploring the historical and contemporary dynamics surrounding this incident. Dr. Swan wanted to demonstrate that the process of memorialising slavery in Bermuda is politically charged, particularly in a society that has historically criminalized black protest but now features a black Government committed to the national promotion of Bermuda’s diverse heritage. Dr. Swan, who teaches at Washington DC’s Howard University, said the issue also centered around the fact that the public discussion and representation of slavery in Bermuda remains “contested space” — and raises questions as to who has the power to define the narrative of slavery, and how those definitions reflect current issues of race, racism and colonialism. “This is especially significant given the highly conceptual and physical visibility of Bassett’s monument, which is also a project of cultural tourism along Bermuda’s African Diaspora Heritage Trial,” he said. An Associate Professor at the university, Dr. Swan obtained his Ph.D. in African Diaspora History from Howard in 2005, and joined its History Department in 2006. His primary research and writing interests are historical and contemporary black political and cultural movements across the Diaspora. His critically acclaimed book “Black Power in Bermuda and the Struggle for Decolonization” was published in 2009 critically demonstrated the impact of Black Power in the island. He is now working on a manuscript about the late Bermudian revolutionary Pan-Africanist Pauulu Kamarakafego [also known as Roosevelt Brown].